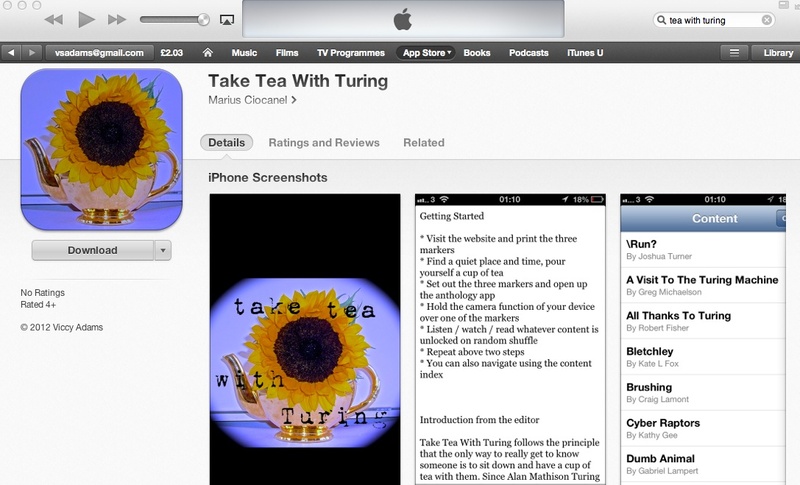 I’m delighted to announce that the Take Tea With Turing anthology app is now available as a free download via the iTune app store. Those of you without your own iPhone or iPad will have to beg or borrow (ViccyIsWriting does not officially endorse stealing) friends/family/colleagues’ devices to get full access to the app, but the contributor bios & short essays about the inspiration behind some of the work featured in the anthology can be found on the TTWT website. Anyone interested in producing an alternative version of the anthology can drop me an email: vsadams [at] gmail.com or tweet me @ViccyIsWriting.